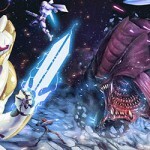 Home » Games » Galaxy Defenders » Galaxy Defenders’ new Kickstarter campaign: The Earth Strikes Back! 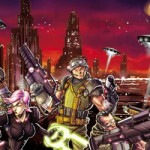 Galaxy Defenders’ new Kickstarter campaign: The Earth Strikes Back! “The Earth Strikes Back” - The exciting Season 2 of our cooperative science-fiction board and miniature game is about to launch, (May 28th at 2 pm in Central Europe time zone, 12:00 UTC/GMT). With Operation Strikeback and Extinction Protocol, it's time to retaliate and fight Aliens on their home planet! In our previous articles we told you about the counter-attack against the Invaders’ base on the Moon, and the new enemies the Agents will fight there. We also told you about the final assault on the Alien home planet and the deadly perils you will have to overcome to win the final battle. Now, it’s time to look at the new Kickstarter and the rewards we are preparing to compensate for your pledges. Our first Kickstarter was very successful - but a bit too complex in structure. We are trying to make things simpler this time. So, we decided to keep things simple and offer both expansions together. This will also help us keep shipping costs reasonable in comparison to the value offered - shipping two boxes together is not much more expensive than shipping one! And we’re talking about BIG boxes - These expansions pack a similar amount of content as the Core Set, with more than 20 figures each (and possibly more coming through stretch goals), new maps, lots of new weapons, tactics, and devices. Operation Strikeback is expected to have an SRP of $75, while Extinction Protocol is expected to have an SRP of $85. Kickstarter backers will get a nice discount on this SRP. But by supporting us in the Kickstarter, it’s not all about the discount, as you know. Let’s look at the rest. 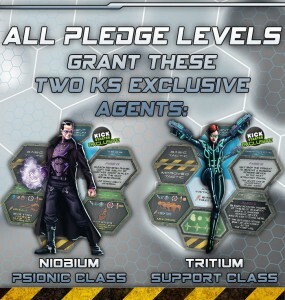 Niobium and Trititium, the exclusive figures for Kickstarter backers. We want to be able to provide more than a warm “thank you” to our backers. You are supporting Galaxy Defenders by committing hard-earned money several months in advance of release, and we think we have to offer something special, in the form of two figures only available to backers. In Season 2, the two figures are Niobium and Trititium. These figures are the first representatives of two new classes. As normal in a miniature-based boardgame, a Kickstarter offers a lot of stretch opportunities: additional miniatures, additional ways to use existing miniatures, new cards, new gameboards, extra weapons and devices. Many of the add-ons we’re developing will be offered free of charge to all backers, as stretch goals – a familiar concept for anybody who uses Kickstarter these days. Several add-ons are offered as options instead: you can ask for them, but as they are not an essential part of the game, they are not “bundled” automatically with the main rewards. 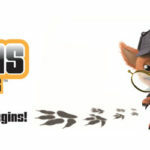 A lot of cool stuff has been created by Gremlin Project we simply couldn't add to the already jam-packed expansions, and it would be a pity not to offer such items just because they couldn’t fit! We've got new master aliens, elite armies, extra agents and NPCs… Plus material that will be useful to anybody who wants to customize his game and create more scenarios, such as additional sets of modular maps or boards. In our previous Kickstarter, we offered the “Ultimate Bundle” – a mega-combo with all Options included, and it was a huge success. This time, we’ll offer the Ultimate Bundle from the beginning – some pledge levels include ALL the options, those present at the time of the launch AND all those that will be unlocked as stretch goals. 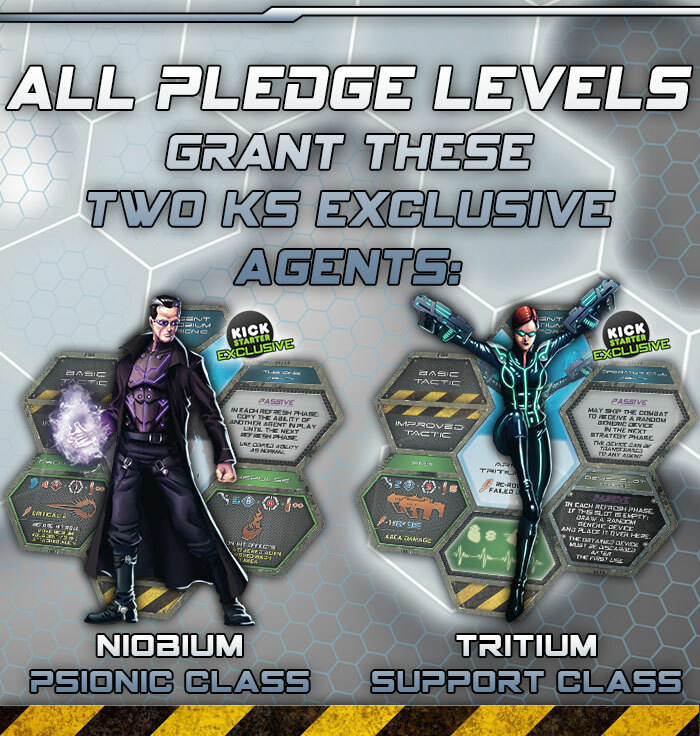 As the pledge is based just on the cost of the options we have at launch and not the additional cost of stretch components, you can easily see that if the Kickstarter hits the stretch goals, these pledge levels will become very interesting. 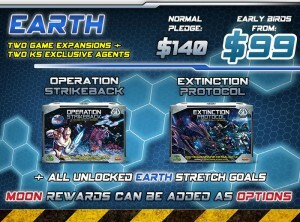 Earth level: new Expansions and the KS Exclusive figures as rewards. All the rewards of the Earth level, plus all the Options (Red) and Red and Blue stretch goals. Galaxy level: all the rewards of the Moon level (Red and Blue), all stretch goals, and the GD Core Set and Elite Alien Army. EARTH (BLUE): Do you want the new Expansions and the KS Exclusive figures as rewards, but want to keep your pledge at the minimum? Choose the Earth level. Stretch goals for the Earth level are coded in Blue. 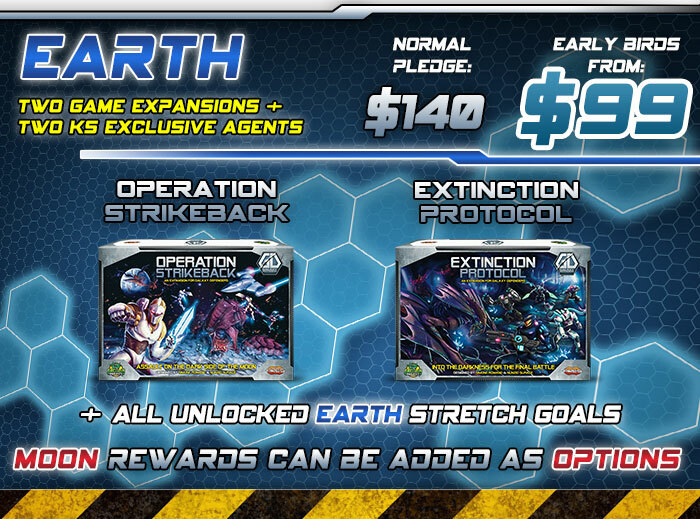 The normal pledge for Earth Level is $140, with Early Bird pledges starting at $99. The SRP of the two boxed sets alone is $160, so it's already a good value. This is also a good choice if you only want to add a few options – especially if you are an Early Bird. MOON (RED): Do you want everything that's included in this Kickstarter, at a great discount, without headaches about which options to add? Choose the Moon level. You will receive all the rewards of the Earth level (Blue) and all the Options (Red). Stretch goals for the Moon level are coded in Red, but you also receive all Blue stretch goals, too. The normal pledge for Moon Level is $255, with Early Bird pledges starting at $179. 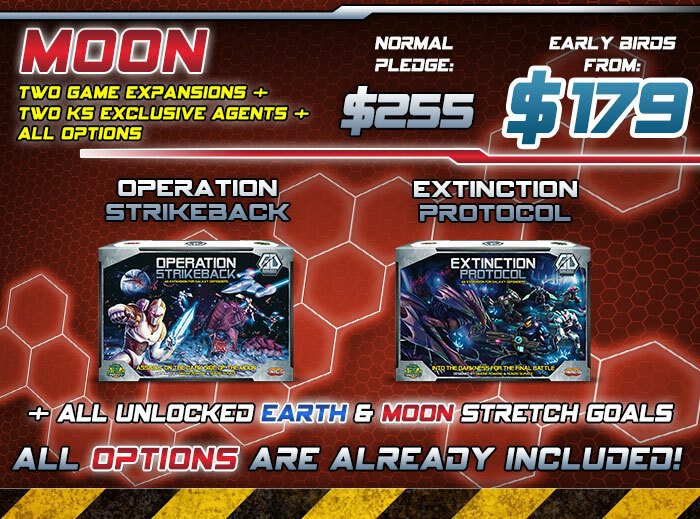 Moon level includes $135 of options at the start (and we hope to unlock a lot more). Add this to the $160 value of the two expansions plus the exclusive figures and you can see there is a very significant saving, if you don’t want to miss any of the add-ons. 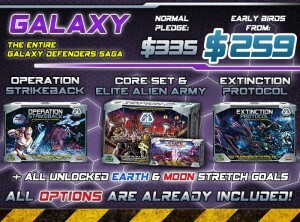 GALAXY (PURPLE): Do you want to join this Kickstarter but you don't own a Galaxy Defenders Core Set yet? Choose the Galaxy level. 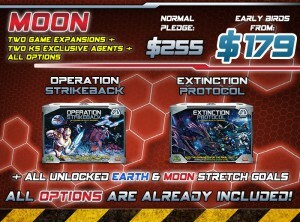 You will receive all the rewards of the Moon level (Red and Blue), all stretch goals, and on top of that, you will also receive the Galaxy Defenders Core Set (SRP $89.90) and Elite Alien Army (SRP $29.90). 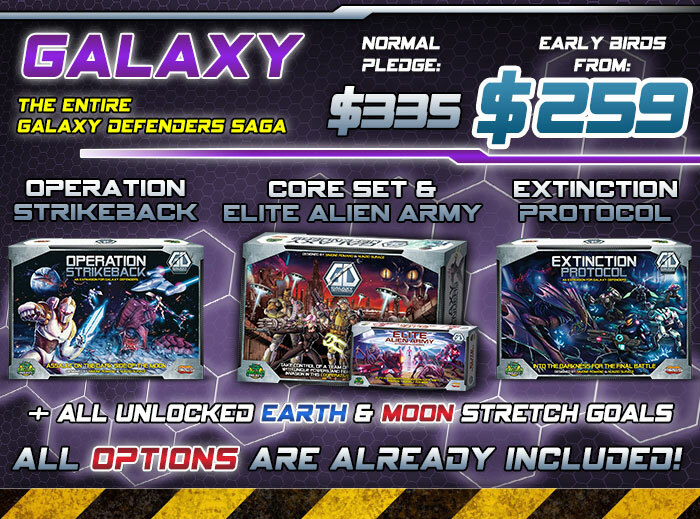 The normal pledge for the Galaxy Level is $335, with Early Bird pledges starting at $259.You will receive the Core Set and Elite Alien Army soon after the end of the Kickstarter, while the expansions will ship to your address when they release, in February 2015. This is a tricky subject in any Kickstarter. Nobody likes shipping, but worldwide distribution of physical rewards is a very expensive process, which must be handled separately. We sent the rewards for the first Galaxy Defenders Kickstarter from two warehouses – one in the USA and one in Germany – and we expect we’ll able to do this for this Kickstarter. This has the benefit of keeping the shipping cost reasonable to backers in the USA and in the European Union countries (especially Germany). The shipment will not cross customs in these countries, so there is no “hidden” cost added to receive your rewards. If you live in Europe, you are aware that there is a nasty entity called VAT (Value Added Tax), and we must add it to everything we ship (our Tax Office is still convinced that rewards are sales, not gifts, no matter how hard we try to explain the difference). So, there is a small added cost for European backers to take this element into account, even if Ares is taking care of most of it.